Last years I have published in the blog some posts (1) dedicated to show what was my estimate of the average discount Boeing applies to its commercial airplanes. I included in those posts the rationale used for the calculation. Find here the post related to the calculation of the discount based on 2013 data of Boeing Commercial Airplanes revenues, deliveries and list prices. 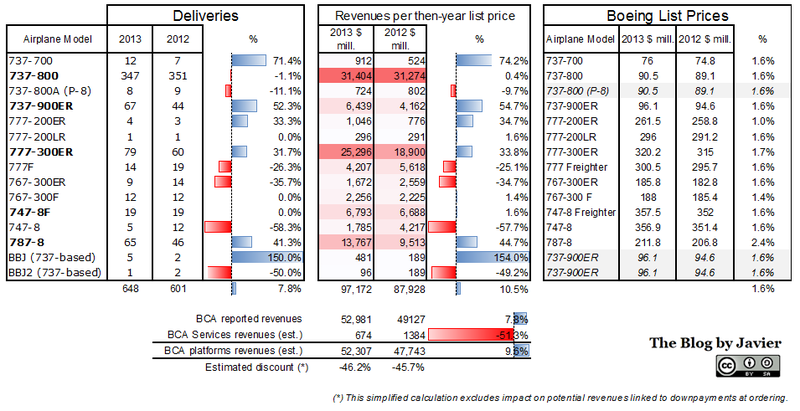 Boeing discount detailed simplified calculation: 2013 vs. 2012. In the table above, you may find for both 2013 and 2012 Boeing reported deliveries per model and Boeing published list prices per model (3) and Boeing Commercial Airplanes reported revenues. What is then estimated? Boeing Commercial Airplanes services revenues (deduced from financial reports reported information), Boeing Commercial Airplanes platforms revenues (derived from the previous figure) and the average discount; this is calculated from the difference between estimated BCA platforms revenues and what should have been that figure had the airplanes been sold at list prices. Results: average discounts of above 46% in 2013 and above 45% in 2012. (1) Find here what is becoming a “body of knowledge” on Boeing discounts: estimates calculated for 2013, 2012, 2011, 2010 and 2009; a review of the French portal Challenges.fr of aircraft discounts prior to Le Bourget airshow of 2013; aBombardier’s CEO statement on what is known in the market as the Boeing discount; Boeing Commercial Airplanes president Ray Conner speaking about the more aggressive pricing they are being forced to offer. (2) I refer to this table as “simplified” as it excludes from the calculation the potential influence on yearly revenues (note, not cash flow) of down payments linked to orders received in then-year versus orders received in previous years for aircraft delivered in then-year. (3) Two assumptions are needed: 737-800A transfer prices from BCA to Boeing Defense Space & Security for the P-8 (for simplicity assumed to be the same as the 737-800 price) and for the 737-based business jets (for simplicity assumed to be the same as the 737-900ER).